This issue’s cover illustration is from Frank Cottrell Boyce’s Cosmic. Frank Cottrell Boyce is interviewed by George Hunt. Thanks to Macmillan Children’s Books for their help with this May cover. The historian as optimist – but not so much for his subject as for its recipients. Fed up with the way British history was presented to children in the mid-nineteenth century, and well-acquainted with the theories of Mr Gradgrind (still with us), Dickens determined upon doing the job ‘for his own dear children’ all by himself. As hands-on editor of his own magazine, Household Words, he composed it, mostly by dictation, as a weekly serial lasting from 1851-3 and in that form it may have been fairly approachable. But once published as a book – in three volumes with only a frontispiece by way of relief – it may have daunted many a child reader as the present 440-page abridgment also runs the risk of doing. Suffering that fate would be something of a pity since, as a text, this volume retains much of the Dickensian swashbuckle that drives the story along and much of his ready contempt for many of the characters with whom he deals. These are mostly monarchs and politicians (there’s not much in the way of what we call ‘social history’ here) and his appalled reaction to what he has found out about them – much of it cribbed from other sources (how did he find the time?) – is funny as well as vigorous: ‘Bluff King Hal’ is impugned as ‘a big, burly, noisy, small-eyed, large-faced, double-chinnned, swinish-looking fellow’ and ‘one of the most detestable villains that ever drew breath’. 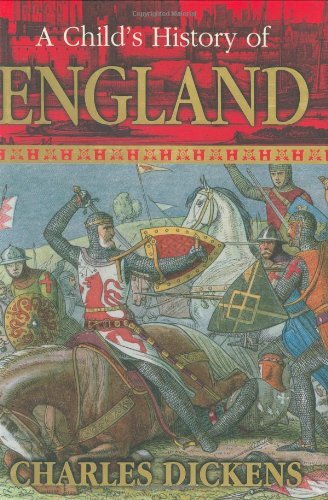 As John Waller says in his excellent Introduction: ‘this is the original “Horrible History”’ and although the truth of many of its facts and anecdotes are more than suspect it does offer continuity rather than choice snippets of what occurred from the days of the ancient Britons to the Glorious Revolution. (A short synopsis by Dickens covers subsequent events up to Queen Victoria and the publisher gives us help in sorting out the confusing sequence of monarchs by supplying a dynastic list and a family tree that comes down to Camilla Parker Bowles.) I regret though that they could not ease the reader’s progress through the book with a few douceurs such as more spicy chapter-titles, narrative running-heads with dates, and, above all, frequent, perhaps thumbnail, illustrations to replace the few very dowdy reproductions of Marcus Stone’s drawings from 1873.